Fenugreek is a plant in the family Fabaceae. 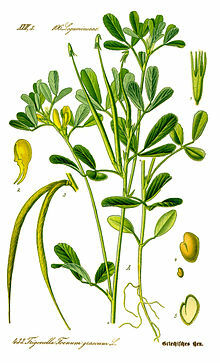 Fenugreek is often used as a herb (the leaves) and spice (the seeds, also called methi). There are not very many people with arthritis in India. People there drink fenugreek tea. Drinking one cup of fenugreek tea every day, made from the leaves, is said to stop the uncomfortable feeling of arthritis. This page was last changed on 9 December 2018, at 01:21.